Ok, so I just discovered this amazing artist today and had to share with you. When I saw a picture of one of her rats I thought it was just a cute photograph and that's what she was selling, photographs. But then I read the description and couldn't believe my eyes. 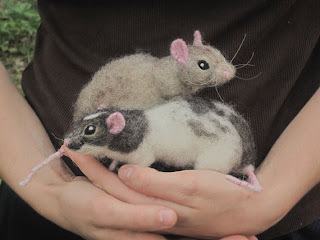 The rat in the picture was actually made by her in a medium called felting. 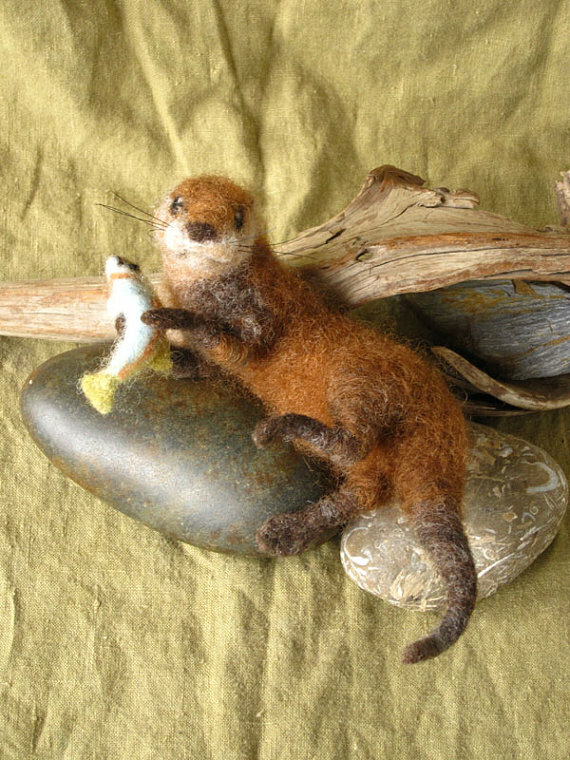 I then clicked on her shop and found the most incredible felted animals. This girl is very talented. So, I had to share her talent with you. Take a look at her Etsy shop. I promise that you won't be disappointed by what you find there! 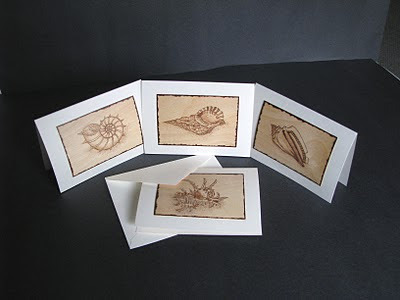 I've recently listed a few new sets of cards. 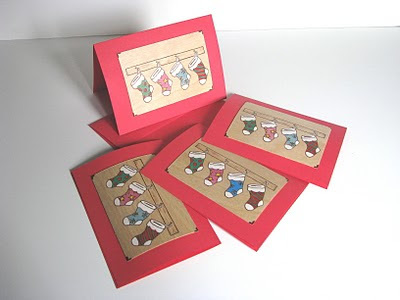 One set I have already done but this time I put the Christmas stockings on red cardstock instead of white. It makes them look a lot more Christmasy. 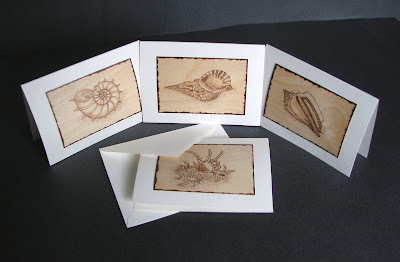 And the other set is a beautiful collection of attractive sea shells. 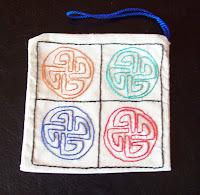 To learn more about them and to see more items available in my shop click here. And don't forget to join me on Facebook! Aaaaaannnnddddd, I'm back! I hope. It's been a frustrating couple of weeks! Mostly due to our computer. It just wasn't working right and we finally decided it was time to take it to someone who knows computers, instead of us trying to muddle our way through and making things worse. We gave our beloved computer over on a Friday, knowing we'd be too busy that weekend and wouldn't miss it. We were hoping that it would be returned to us on the Monday. But it wasn't until Wednesday that we got a call about it. The tech asked if there was anything important on it as he recommended that it was best to clear the entire computer and start again. I said I didn't think there was anything too important on it that I'd miss but when is said that I was only thinking of files and pictures that have either been saved somewhere or are so old they're irrelevant. What I didn't think of was the software that would be deleted. And the crazy amounts of fonts I'd collected over the years. It never occurred to me that those would be affected. So even though we finally received our computer the following Friday, a whole week later, it was still not of much use to me since so much had to be reinstalled and recovered. And one piece of software that I was using to edit pictures has been lost forever. I gave the disk away at a garage sale we had a couple of years ago. 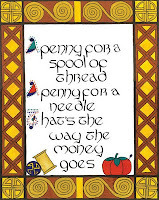 Oh well, guess that means I'll have to start saving for better photo editing software, Photoshop. Or, if I've been good, maybe Santa will bring it for me for Christmas. *wink, wink* Meanwhile, I'm doing my best to fiddle with my pictures to make them worthy of being posted on Etsy. Photos are one of the biggest elements of a listing. It's just so frustrating and time consuming! Even with the computer not at 100% life has just generally been busy and there hasn't seemed to be much time to get a lot of burning done. I did manage to finish some custom orders (3 of them are Christmas gifts so you'll have to wait to see pictures), like the one I did for my very good friend (see below), B's box is finally done and I completed two more sets of cards. It doesn't end there though, I have more custom orders to do and still a ton of ideas that I'd like to work on. A gift from a daughter to her Mother on her birthday. I was honoured to be a part of this wonderful gift. B is pretty happy with is box. 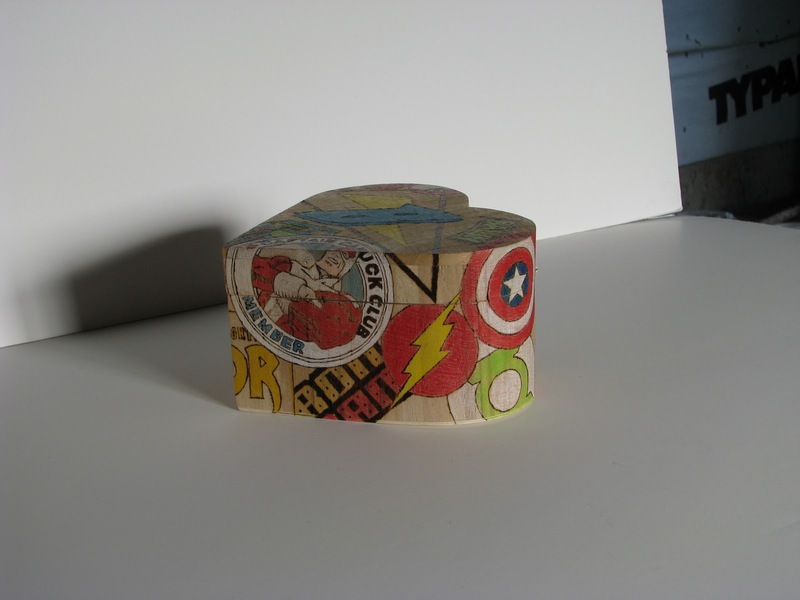 He loves the superheroes, Pokemon and Scooby Doo images I put on it. The heart shaped box has hinges on the back and stays closed with little magnets on the lid and base. These will be listed in my shop tomorrow or Thursday. Take a look at my Etsy shop to see more items available for purchase and join me on Facebook! I am finally done B's box! He has been a very understanding and patient customer. It was originally requested to be done by his birthday, August 14th. I've had a lot of other things on the go so his box had to be put further down my list. It's finally done and I will try to take pictures soon. I realy like it and most importantly, so does he! 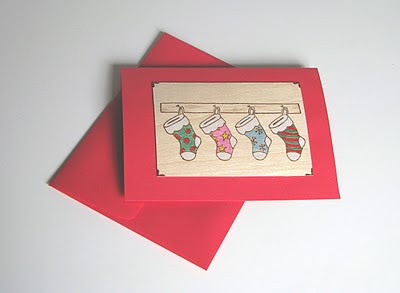 I made my very first Etsy treasury today! I called it Swirling Fantasies. I love spirally, swirly things so I thought I'd focus on that theme. 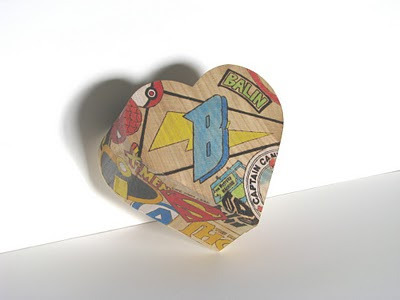 Some of my favourite shops have swirls in their art so it was easy to choose those pieces. Finding more to compliment the items took a little bit of time but I think I found some nice ones. It was really fun to look through other people's shops and see what they're doing. 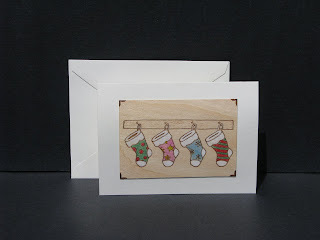 Yesterday I listed these cute stocking cards in my shop. 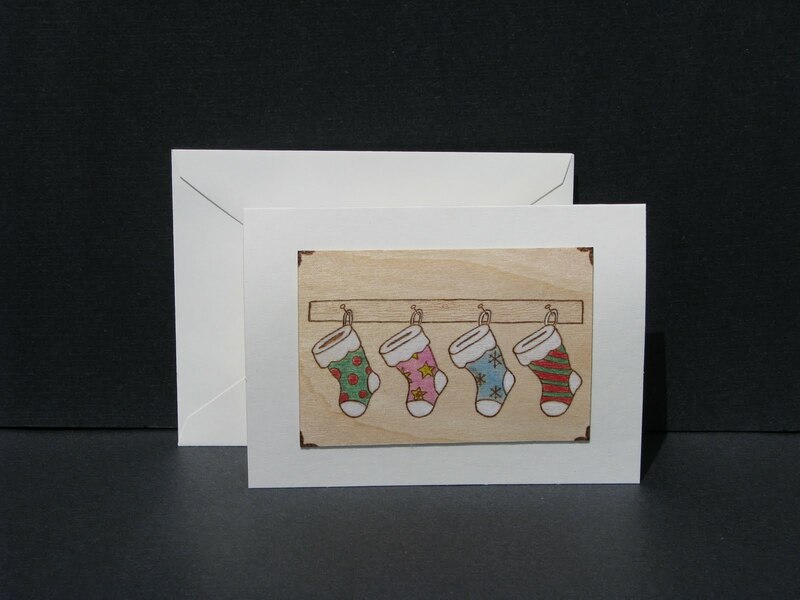 One of my friends suggested I put them on coloured card instead of the ivory, which is super smart. I've been procrastinating on buying more coloured cardstock (for no good reason) and her comment lit the fire, so this morning I got on the phone and ordered more. I'm so excited! My order should be here by Monday. Now all I want to do is get to work and burn more Christmas images so I can get them in my shop. Just need to find the time, as always. 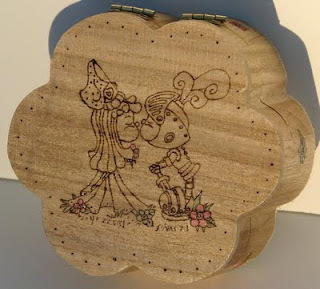 Here is an adorable little flower box for the little princess in your life. I've had this image for many, many years and was going to use it for our wedding invitations but decided to go with something a little more grownup in the end. But this gentle kiss between a princess and her knight has always had a soft spot in my heart and I've been patiently waiting for a chance to use it. When I found this cute flower box I knew it would be perfect for this fairytale image. 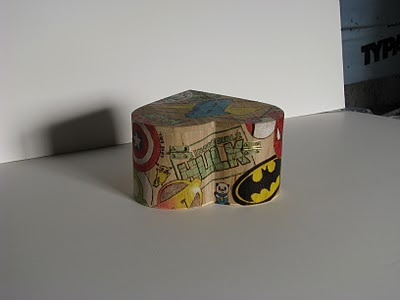 Learn more about the box and see what else is available in at my shop. Yesterday we had a garage sale. The boys have been talking about doing a garage sale for a very long time and have even been suggesting toys they'd like to put in it. Then one day, B came up with the idea to sell lemonade. I agreed and thought it could be a fun idea and a great way to get them involved. And because I am the way I am I just had to try and make real lemonade from scratch. Ok, I didn't actually juice lemons, we used Realemon, but I boiled the sugar and water to make syrup and cooled it to make the best tasting lemonade I've ever had. I don't really like citrus drinks and usually stay away from lemonade but this stuff was pretty darn good. Perfect for a hot and humid day, which is exactly what we had yesterday. And so, because it was so tasty and easy to make, I thought I'd share the recipe I used with you. Combine the 1 cup water and sugar in a small sauce pan. Bring to a boil while stirring to dissolve the sugar. Allow it to cool to room temperature. Then cover and put in the refrigerator until chilled (I had it in the fridge over night). If you use real lemons remove the seeds but leave the pulp in the juice. 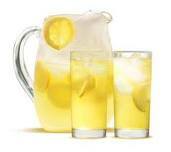 In large pitcher stir together chilled syrup, lemon juice and remaining water and serve. We also sliced up some lemons and had them floating in the pitcher. This made it look really good and added to the citrus flavour. A couple of weeks ago I agreed to participate in my first group project through an Etsy team. 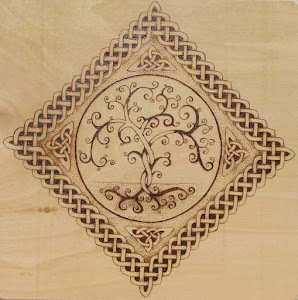 A couple of members of the Celtic Knot team and myself decided to use the same celtic knot using our own mediums. At first I had a bit of a mental/creativity block trying to decide what I was going to do. 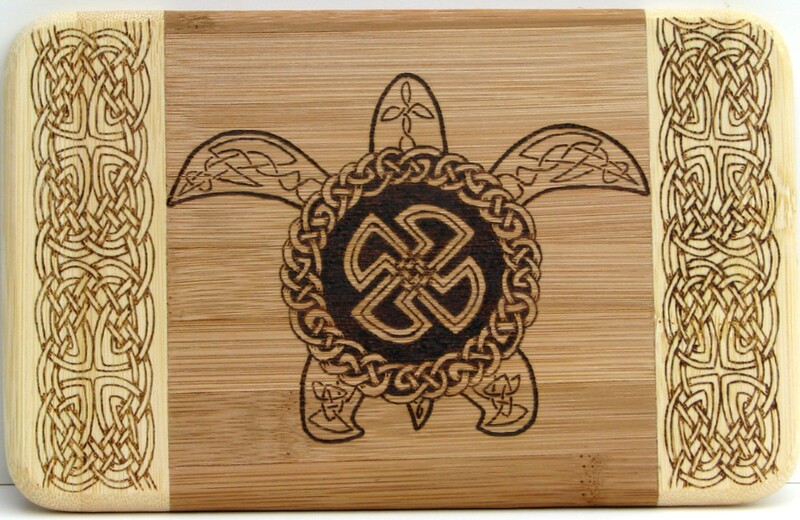 But after a few days of brainstorming about trees, gardens, animals and more complex knots I came up with the idea of incorporating the knot into a cute little turtle design and burning it onto a bamboo plaque. 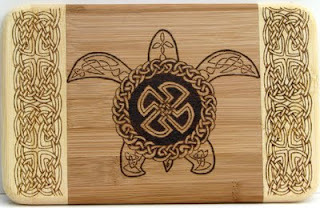 The centre of the turtle is the knot we were all to incorporate in our pieces. 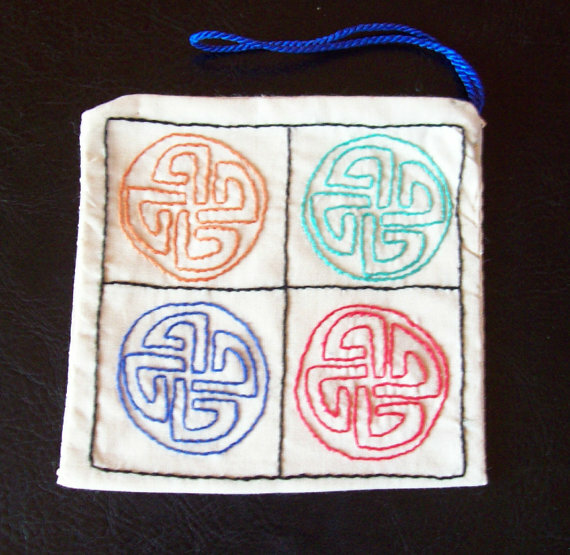 Kathryn from PozoDulce intricately hand embroidered the knot in a repeated pattern on a delicate mini purse. 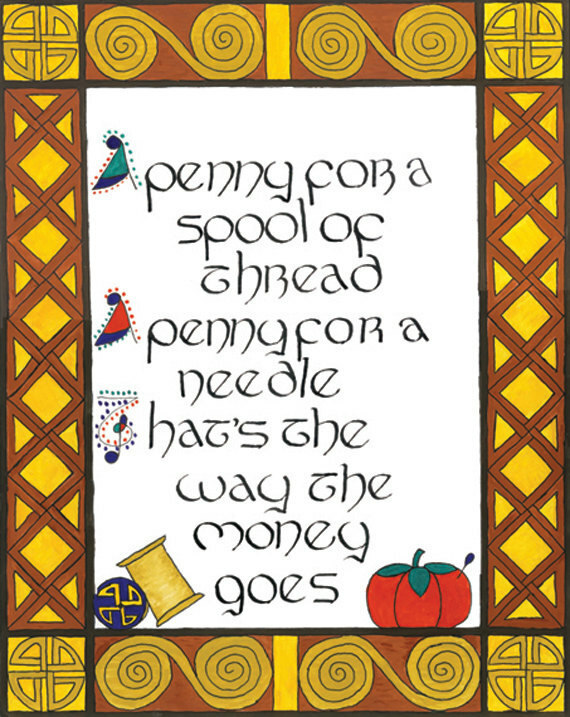 And Roxanne from Knotscribe created a beautiful hand painted page with part of the poem "Pop goes the weasel". 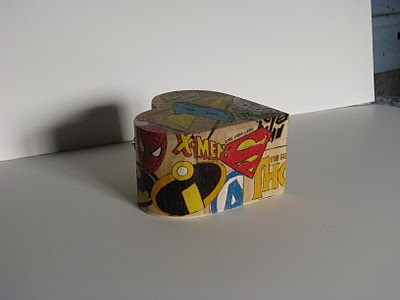 Here is the treasury where our work has been featured along with some other very, very talented artists. Check it out, you won't be disappointed! I had so much fun being challenged this way I can't wait to do it again. It felt really good knowing I was making something that was a part of something bigger. 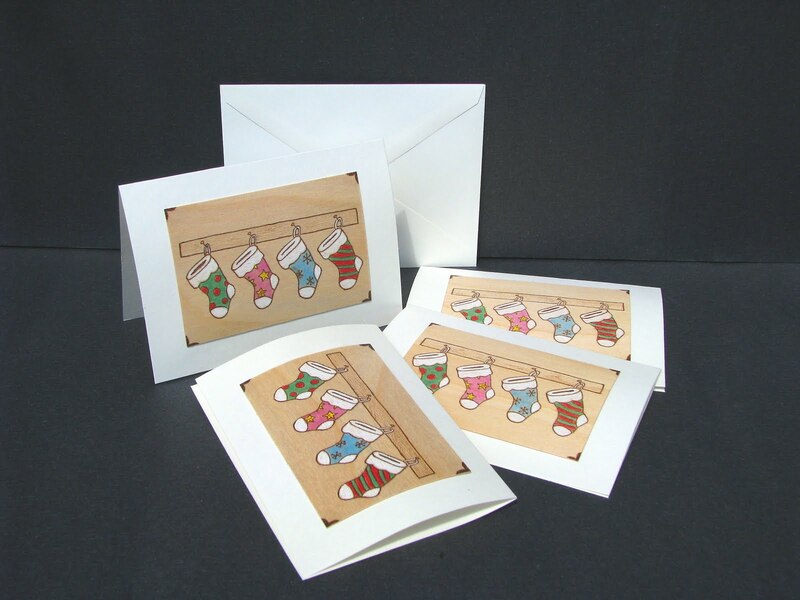 To see other items available in my shop click here.